“The Fiery Furnace” is the second book in the “Ordeal by Fire” trilogy by F. Scott Kimmich. I had not read the first book; however, thanks to the preface and prologue I had no problem enjoying this one as a standalone book. The quality of the story made me wish I had read the first one, although I did not need it to be able to follow the storyline. The story takes place in the first half of the 13th century at the start of the Inquisition. French Baron Rambouillet is seeking revenge on the family of Olivier de Mazan for having disfigured him in a brawl. The Mazans are heretical “Cathars,” and Rambouillet uses the Inquisition to track them down. Fleeing before him, four members of the family end up in Montsegur, the heretic’s mountain fastness, along with a soldier of fortune who turns out to be the son of Robin Hood. At the same time, Count Raimond of Toulouse, a sympathizer of the Cathars, is using the boudoir to persuade Queen Blanche of France to keep the French from invading his lands. Raimond’s plans unravel, and French crusaders besiege the heretics at Montsegur. Hope for rescue dwindles for Mazan and his family, and they arrange to move the Cathar treasure to safety before the climactic outcome of the siege. I love Kimmich’s writing style! Although I do love Old English and French Historical fiction, I sometimes prefer to watch them as movies to reading because I find it difficult to follow the old language in a book. 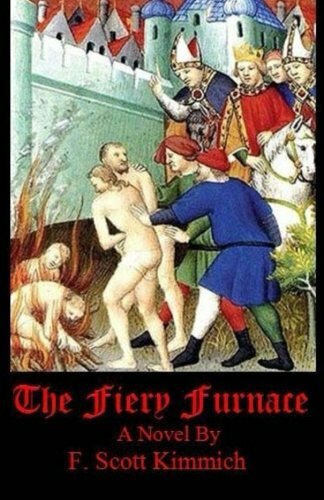 I must say that reading “The Fiery Furnace” was a breeze! The author has mastered the written word for this era to the point that it felt genuine to the times and setting, and as a reader I had no problem understanding at all, which made the flow wonderful and easy to follow. The plot is intriguing and suspenseful, mixing historical legends, such as Robin Hood, with historical facts such as the horrors of the Inquisition. The characters are so real; I could hear their voices in my mind as I pictured them. Impeccable writing for sure! In all, I truly recommend “The Fiery Furnace” by F. Scott Kimmich as a five-star well-written, intriguing, raw, and suspenseful historical fiction read! Will definitely check out the first book and look forward to the last one in this trilogy.